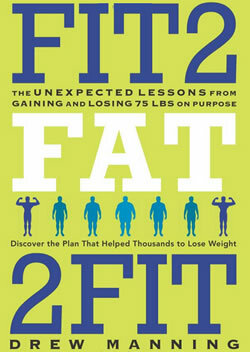 Fit2Fat2Fit is written by Drew Manning, a personal trainer and self-professed fitness junkie. Manning loved working out, always ate healthy and had never been overweight in his life. However, he was still having difficulty helping his clients achieve their weight loss goals. This book chronicles his personal journey where he intentionally gained weight – and lost it again. His purpose was to understand his clients better so that he could become a more effective personal trainer. He cronicled his journey on his blog. Manning needed to find out what it was really like for his clients who were struggling. So, he made the drastic decision to stop working out and began eating the typical American diet of fast and processed foods. This resulted in a weight gain of over 75 pounds within six months. His goal was to lose the weight as quickly as he gained it, which he expected would be simply a physical undertaking. However he was given lessons about the emotional and mental challenges that arise during the process of losing weight. This enabled him to better understand why his clients had difficulties sticking with the program. His experiences helped him create a diet plan that was more effective and easier to follow. He suggests eating every three hours during the day to keep you satisfied and reduce your desire for unhealthy foods. This way of eating also keeps your blood sugar levels stable and stokes your metabolism. The meal plans that are designed to suit the caloric needs of the average male. Female dieters will need to adjust the meal plans by reducing the daily caloric intake by about 400 calories. This can be achieved either by consuming smaller portions or eliminating snacks. You will cut out dairy products and grains to reduce your intake of fats and carbohydrates as well as prevent digestive problems. This meal plan also helps you break through food addictions. After thirty days on this plan you will gradually increase your intake of carbohydrates, primarily from fruits and vegetables. You are also permitted to have one cheat meal each week but it should be no more than 700 calories. Chicken, turkey, salmon, shrimp, beef, egg whites, whey protein, almond milk, peanut butter, pumpkin seeds, brown rice, berries, banana, spinach, lettuce, red pepper, mushrooms, cauliflower, onion, avocado, salsa, soy sauce, olive oil. For the first month Manning suggests focusing on breaking bad eating habits and cleansing your body of toxins from processed foods. This is easier to do if you limit your physical activity to only stretching and core exercises. After the first month you can start to incorporate circuit workouts and resistance training into your daily routines. The book includes thirty of Manning’s favorite exercises as well as workout plans involving dumbbells, an exercise ball and a pull-up bar. The workouts can be modified to suit beginner, intermediate and advanced fitness levels. Includes three months of meal plans. A selection of simple recipes is provided. Identifies some of the pitfalls that can interfere with the intention to eat healthy and exercise. Once-a-week cheat meal makes it easier to stay on a diet long term. Small, frequent, high-protein meals help to control appetite. Many foods must be eliminated including cereal, pasta, rice, bread, potatoes and desserts. Does not contain precise meal plans for different calorie levels. Requires the use of nutritional supplements. Some of the exercises may be hard on the knees for those who are overweight. Fit2Fat2Fit offers a comprehensive program to help you achieve your weight loss goals, including meal plans, recipes and exercise routines. The book documents the experiences of a personal trainer as he went through the process of gaining and then losing weight. This allowed him to achieve a greater understanding of the challenges involved for the average person who wants to get in shape. The result was that he was better equipped to design a weight loss plan that was effective and easy-to-follow.